Why Is my Hot Water Not Working? 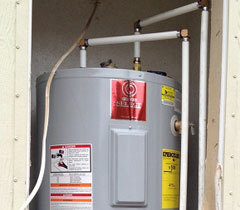 - $59 Rooter & Plumbing Service in Phoenix, AZ provides residential plumbing and repair services. $59 Rooter & Plumbing Service in Phoenix, AZ provides residential plumbing and repair services. Home → Water Heaters → Why Is my Hot Water Not Working? If you need to replace your water heater and need a plumber in the Phoenix area feel free to call us. We are a safe, friendly, locally owned and operated residential plumbing company with excellent reviews. We’ve all gone through it: you turn on your hot water for something that needs to be done – dishes, laundry, a shower before work – and it’s not there. What gives? Well let’s look at it because there are a number of possibilities. Let’s start troubleshooting at your water heater. Is it tankless or traditional? If it’s tankless, it could be as simple as checking the circuit breaker. If that’s not it, then you need to know whether it’s a gas or electric unit. In a tankless system, the water is heated only as it’s used and if the heating system is out you’ll probably need to call someone, particularly if it’s gas. Traditional heaters present different issues. Again, you need to start with basics: gas or electric? If it’s gas, make sure that your pilot light is on. If you can’t fire it, you may have an issue with the ignition system. Since it involves gas, you should call a qualified professional. If your unit is heating, regardless of whether it’s gas or electric, you may have mineral deposits in your tank. You’ll need to drain it (you’ll want a hose and a bucket at a minimum. Drain it outside if at all possible). Hook the hose up to the faucet on the side of the heater, turn off the water going into the heater and then drain away. If you see chunks of material come out, you’ll need to either scrape the bottom of the tank using something like a coat hanger and flush it again or use a de-limer. You’ll need to read your manual first to make sure that you don’t void any warranty. Of course the problem could be fairly simple too: does your hot water simply run out five minutes into a shower? Maybe your heater just isn’t big enough. Maybe your children have entered their teenage years and the heater simply can’t manage 30 minute showers. Some of these problems may result in having to replace your heater. At that point you’ll want to consider the basic issues: gas or electric? Tankless or traditional? All of these are important questions to consider, but even after you resolve them you have another absolutely critical consideration, and that is your local building code. Certainly you can make this a DIY project, but if you are not within code and you later decide to sell your house, your buyer will likely demand that your heater is brought up to code. So in other words, don’t be penny wise and pound foolish. If you have to replace your heater in the Phoenix area, give us a call. We’ll be happy to discuss your options and, if you like, to do a first-class professional install. Rooter & Plumbing Service in Phoenix, AZ is owned by Ron, an experienced expert, who has been servicing the Phoenix metro area since 1982. Ron believes in hard work, dedication and honesty and is willing to provide the best advice to all callers. Rooter & Plumbing Service in Phoenix, AZ is able to offer lower and more reasonable prices because Ron believes in keeping his company small and personal. You can depend on qualified plumbers to take care of your plumbing repairs as well as sewer and drain cleaning needs. $59 Rooter & Plumbing Service in Phoenix, AZ thanks you for providing us the opportunity to serve you and guarantees full satisfaction to all our customers. We specialize in allowing our customers to speak directly to a plumber when they call. We are happy to give free advice over the phone and provide pricing on most jobs. Sewer rooter and drain cleaning is our primary focus. We do sewer inspections and repairs as well as locating. We do residential repairs and install fixtures such as disposals, faucets, toilets, hose bibs, angle stop valves and water heaters. We are not accepting re-pipe or remodel jobs of any kind at this time. We accept all major credit cards and take over the phone payments from out of town property owners.